Summer Food: Mother Knows Best As summer winds down, so, too, does our series on summer foods. This week's final installment focuses on moms — and their singular cooking techniques. We hear about Chinese barbecue sauce and "wacky cake." From the first perfect peach to clams from a favorite shack, listeners share summer food stories. 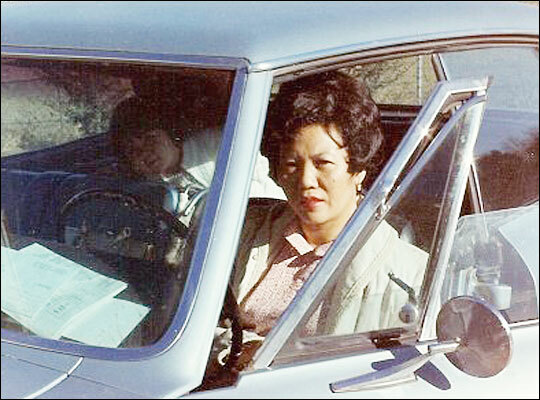 Yum King Wong with her daughter Wanda (inside darkened car) in the 1970s. Wong immigrated to the U.S. from China in 1948, and developed her own, instinctive cooking style. She died in 1996. Get recipes for Mrs. Wong's barbecue sauce, Mary Carole Battle's mother's "wacky cake." Get more recipes from NPR.org's Web-only food column, Kitchen Window. As summer winds down, so, too, does our series on summer foods. This week's final installment focuses on moms — and their singular cooking techniques. Wanda Wong's favorite summer food is her mother's barbecue sauce, which is made with Heinz ketchup, garlic and salted brown beans — a Chinese staple-- plus a few other ingredients. It's sweet and savory, mellow and pungent. 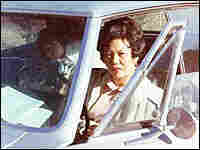 Wong, of Loveland, Colo., wanted to learn how to cook like her mother; that endeavor proved to be a bit of a challenge. Her mother immigrated to the United States from China in 1948, and she had to teach herself to cook. "She always trusted her own instincts and her own sense of taste," Wong recalls. When Wong asked her mother to explain how to make certain dishes, her mother said things such as "You use a finger of garlic." Wong wondered, "Well, which finger?" One summer, after her mother died, Wong and her husband attended a potluck barbecue. They brought the ribs, and Wong made her mother's sauce. She worried that her friends wouldn't like it. But she didn't need to worry: They loved the sauce, and asked her for the recipe. "And I said, 'Do you have a pen? What you do is, you start out with a fingerful of garlic, and then we go from there,'" Wong says. Preparation is key to our next summer food, which comes to us from Mary Carole Battle of St. Petersburg, Fla.
Battle says that growing up, she and her best friend celebrated many of their birthdays together. When it came time to sing "Happy Birthday," her friend's mother always placed a huge, beautifully decorated, store-bought cake in front of her. Battle's mother, meanwhile, placed a "wacky cake" in front of her. "Looks might count for something," Battle says now, "but everyone always came back to the wacky cake for seconds." Battle, who celebrates her birthday this Friday, says her mother called it wacky cake because of its pure simplicity. The ingredients — which include an unusual-for-a-cake item: vinegar — are all poured into one pan, mixed up and thrown in the oven. "They're always delicious," Battle tells Michele Norris, "and I hope she makes one for my birthday." Combine all the ingredients in a small bowl. Makes about 1 cup. Use sauce to glaze or marinate meat before cooking. If using as a condiment, cook sauce uncovered over low heat in a small, heavy saucepan at least 20 minutes. Stir frequently. *I recommend Koon Chun brand hoisin sauce and Yeo's salted brown beans or Koon Chun bean sauce for this recipe. In an 8-inch- or 9-inch-square cake pan, sift the dry ingredients. Make three holes; pour the vanilla in the first, vinegar in the second, and oil in the third. Pour the cold water over the mixture, and stir until no longer lumpy. Bake at 350 degrees for 30 to 35 minutes. If desired, top with seven-minute frosting (below). Mix all ingredients except the vanilla extract in top of a double-boiler; beat about 1 minute to mix together. Place over bottom half of double-boiler; once water has started boiling, beat on high for 7 minutes. Soft peaks should form easily; remove from heat and add vanilla. Beat another minute or two.